I loved Legend by Marie Lu and if you've not enjoyed it yet then this is the time to get in on the action. Penguin Group has so graciously given 3 copies for me to giveaway. That's 3 winners folks! Guess what else? It is ONLY for my UK peeps! That's right. Let's keep this in Great Britain shall we. You must live in the UK or have a UK address. The contest is only for my peeps in Great Britain. Holla! @Whispering Words Your welcome! But it's thanks to Penguin! They are giving the copies. We never get only UK giveaways! @Michelle I'll keep my fingers crossed for you!! Maybe you'll win and won't need that spare change after all! 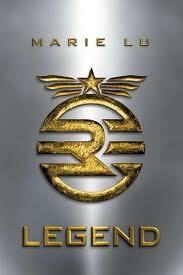 have been wanting to read Legend for a while now!